How are Scotch whisky bottles redesigned? Even the most successful and easily recognised Scotch whisky needs a little wash and brush-up from time to time. But how do brands innovate without alienating their loyal fans? Ian Wisniewski delves into the world of redesigning Scotch whisky brands. Sometimes you see a picture of a celebrity, or meet someone you actually know, and you notice that something’s a little bit different. They’ve become… more youthful. Sometimes the changes can be quite dramatic – and we begin to wonder: how did they manage that? Brands can also be subject to the aging process. At a certain point in time, their appearance needs to be reviewed. This can result in subtle, barely noticeable changes, or far more significant differences. And when this happens to our favourite Scotch whiskies, in which we’ve invested time, money and emotion, we feel we have the right (not to mention the authority) to deliver our verdict. The question is: when does packaging reach a ‘certain age’ and need to be reviewed? Moreover, the lifecycle of packaging is subject to a range of contributory influences. ‘With the continued rise in digital communications, the flow of information around the world has never been quicker and, as such, fashion, design and contemporary culture evolve more rapidly than ever,’ says Ian Chapman, marketing director at Gordon & MacPhail. Another factor is that the range of packaging options is continually evolving and providing new opportunities. ‘A lot of the factors surrounding packaging are what fits with brand values and aesthetics, but changes can also be prompted by new technology,’ says Peter Moore, Ballantine’s global brand director. The vital question when considering any packaging changes is: how do you find the right balance between retaining or updating the existing features, and introducing something new? Let’s consider a test case. ‘With Benromach we evaluated our core brand values alongside carrying out extensive market analysis, to develop our revised marketing strategy,’ explains Chapman. ‘The design of the new packaging flowed naturally from the results of that process. The aim is to be relevant to potential new consumers, but without losing any existing consumers on the way. But is it possible to ensure that balance? With every detail of the packaging subject to scrutiny and review, are there any ‘classic’ design elements that could be considered timeless? ‘Crests, logos and brand symbols tend to be quite long-term,’ says Moore. ‘Ballantine’s crest, for example, goes back to 1938, with the design of coats of arms granted to us protected anyway. Whenever there are any modifications to the packaging, there is one key reaction that everyone hopes for. Clearly, attractive packaging can achieve an enormous amount, and it’s tempting to think of any design modifications as the whole story. But it doesn’t end there. ‘Even a small change to the packaging goes all the way through the line, including point-of-sale, advertising, shelf talkers, and our library of support material, all of which have to be updated,’ explains Moore. Changing the design of a bottle is a vital and sensitive process – but it’s also just the beginning of the journey. Coming up with a new design for a Scotch whisky bottle is a long, complex and painstaking business. Two limited edition blends will feature music-inspired designs from artist Felipe Pantone. It is imperative for new releases to convey brand identity, but how do producers achieve success? Introducing Ballantine’s Hard Fired, a smoky, ‘masculine’ Scotch finished in extra-charred casks. 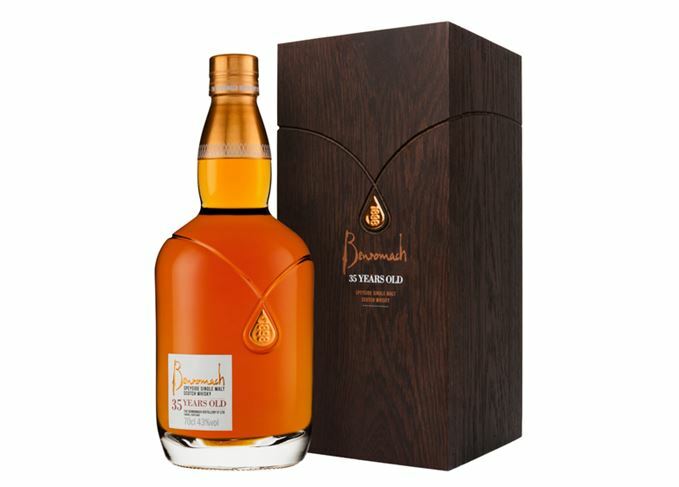 The Speyside distillery’s series of single cask bottlings from the 1970s continues.